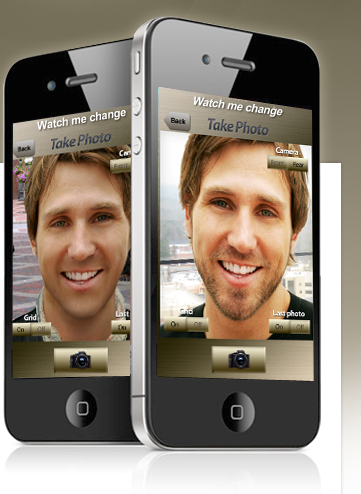 Watch Me Change is an iPhone app for creating time lapse videos of your changing face, pregnancy, weight. Just snap a photo every day and Watch Me Change will turn those photos into a time lapse video with the tap of a button. I wish I had this app when I was pregnant! I was planning to create a time lapse video of the growth of my belly, but I wasn't consistent enough with it. If I had Watch Me Change, I would've been reminded on a daily basis and been able to quickly snap the pics with my phone. With the touch of a button Watch Me Change Face takes those photos you have taken and mixes them into a short video that plays them sequentially, flashing each one for a very short period of time, making it look as though the faces are changing in real time. Watch face change videos right from your iPhone or upload them to social networking websites like YouTube or Facebook, sharing them with family members over the internet.